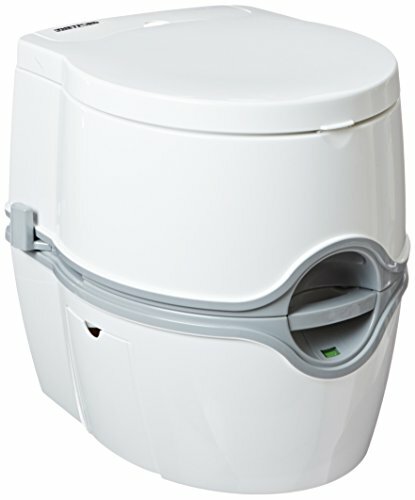 Thetford 92360 Porta Potti 55E - the premium camping toilet on the market. Can be used in many outdoor situations including camping, boating, trucking and indoors for medical or convenience reasons. Easy to carry, transport, use and clean. It's comfortable, mirroring an everyday domestic toilet. 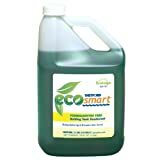 The water tank holds enough for up to 56 flushes meaning you don't have to constantly refill it and the waste tank is even larger. Battery operated flush system but has a manual override if required. Made from a strong and durable product that is weather resistant. Its larger dimensions will mean that it won't suit small storage locations. Like any non-manual equipment, there will be times when the batteries will run out or the pump could stop working. Based on our usage and the reviews of others, this is not a big issue. With more features comes additional expense and this portable toilet is at a premium price point. If this is the first time you are planning on buying a portable camping toilet, then this is the one for you as it breaks down many of the fears that first time campers and users have of using portable toilets. Often associated with inconvenience, discomfort and even embarrassment, this porta potty is at the top of its game. It's a premium toilet on the market and for good reason. It has all the design features and functionality to make your life on the road easier. Because of the size of the unit, it also makes it a great camping toilet for adults. It is rated highly by those who have used it before and its affordable price is a huge feature. The fact that it is indeed so portable and can be taken with you anywhere means it's a worthy addition to any household. If you are traveling anywhere, or even just going somewhere for the day, having access to a portable toilet is the ultimate convenience. It’s versatile. Not only is this the best portable toilet for camping, but it can easily be used on boats, RVs and campervans and on trucks. It can be used for people who live a more sustainable lifestyle out in the woods, or even for medical purposes for the infirmed. It’s a close representation of a domestic toilet, taking the stigma of using a camper toilet away. 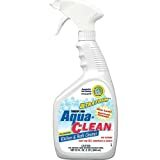 It’s very easy to use and easy to clean. Two of the most important features when considering which is the best portable camping toilet for you. Easy to view waste tank and water tank levels. The battery flush controls are hidden away maintaining the minimalist look of the toilet. It has a hidden toilet paper holder that gets tucked away inside the unit. This also means that the toilet paper is always close by and not left out in the elements to get wet either. Both upper and lower tanks have robust handles to make carrying it easier. Having a rotating waste spout means that the actual distance between you and where the waste empties from is increased, therefore reducing the opportunity for splashing. Having a portable toilet onboard your RV, camper or boat, or with you whilst you are camping or driving means that you are fully self-contained. 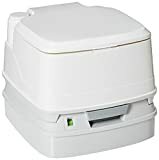 The Thetford 92360 Porta Potti 550E Curve is a premium portable toilet, packed with all the features to make going about your business as comfortable and user-friendly as possible. With a modern, curved design and height it’s the closest thing to what you use at home. A large bowl size, an internal toilet roll holder and a battery operated flush will make it feel even more familiar and will make you question, if only for a moment, where you actually are! This is no ordinary camping toilet. It also comes with a plastic lid and seat. The robustness and size of the unit also means it will hold larger people well. There is, however, an option to buy an add-on “hold-down” kit which allows the portable camping toilet to be secured to the floor or whilst you are traveling. Keeping an eye on the fresh water and waste tanks is a necessary part of owning a chemical toilet, but with the Thetford 92360 Porta Potti 550E Curve, it is super easy. A tank indicator gives easy visibility to how much fresh water the portable toilet has left and how much more capacity the waste tank has until it requires emptying. The controls are hidden inside a lift up flap, keeping them out of the way but still accessible. This unit carefully avoids one of the main concerns people have when using porta potties. Spillage and splashback are not something that you want to have happen to you. Nor do you want to smell the toilet. Thankfully, this toilet has the necessary design features to make it seal correctly to avoid those nasty odors from permeating your camping space. A simple lever is used to open and close the opening from the bowl to the waste tank before and after use. On the subject of cleanliness, the sleek, minimalist design of this toilet makes it a dream to clean and keep clean. The lid and toilet seat may be easily lifted up and cleaned around and the bowl contains no hard to get to places. The water and waste holding tanks are both large enough to take the hassle out of constantly refilling or emptying. 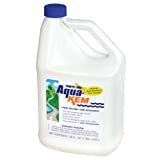 With a 4.2 gallon capacity, the fresh water tank will last for around 56 flushes before you need to refill. It comes with a strong handle to make it easy to carry. 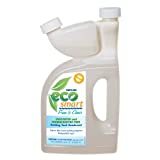 The waste tank holds around 5.5 gallons and also comes with a strong handle to hold the waste tank when emptying and a rotating, easy to pour spout. It is removed from the portable toilet unit via a pull-out lever. The spout has a good size opening to allow for immediate cleaning after the tank is emptied. 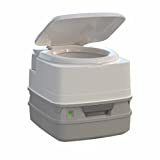 One of the reasons why this is the best camping toilet is because if the batteries do run out whilst you are away and you don’t have any spares, the toilet can still be used. A manual flushing lever can be used in conjunction with some fresh water being added to the bowl and flushed as normal. Using good quality batteries gives more power for a better flush and is therefore also more likely to keep your toilet bowl cleaner. Thetford has a one year warranty for portable toilets that are used for personal use and ninety days for commercial use. The standard disclaimers apply. To help keep the toilet clean, put some water or a small bit of toilet paper in the bottom before using it for solid waste. Keep some wet wipes close by to encourage others to clean the toilet after use if necessary. Only use good quality AA batteries and keep at least one spare set with you in case they run out. 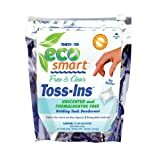 Even though the waste tank won’t spill on you, if you aren’t used to handling portable toilet waste tanks, it might be a good idea to have some disposable gloves with you.